MAY 27 Bryan Clauson, USAC’s 2010 National Driver Champion, will seek back-to-back victories in two of America’s major traditional racing events May 27 as Indianapolis, Ind. celebrates the 100th anniversary of the prestigious Indianapolis 500 Mile Race. “BC’s Bandwagon,” a cooperative effort between INDYCAR, USAC and race organizers at the Indiana State Fairgrounds, will offer race fans a unique opportunity to watch Clauson go for the “double.” A special ticket package will include tickets to Miller Lite Carb Day at IMS, a parking pass and IMS food vouchers, a Hoosier Hundred reserved grandstand seat and pit pass, plus a round-trip bus pass from IMS to the State Fairgrounds and an autographed Bryan Clauson hero card. The bus will depart IMS at 3:30 pm and return at 10:30 pm from Lot 3 (the INDYCAR office). The price for the “BC’s Bandwagon” package is $48 per person (a $102 value). Miller Light Carb Day ticket holders can also receive a $5 discount at the gate for the Hoosier Hundred. To order the “BC’s Bandwagon” package, go to https://imstix.brickyard.com/promotions and use ROADTOINDY in the package code, then select “BC’s Bandwagon, or contact the Indianapolis Motor Speedway Group Sales at 1-866-221-8775. Clauson, the Noblesville, Ind. driver who recorded 10 USAC feature victories in 2010 on his way to the National title and added the 2010 USAC Mopar National Midget crown, also was named to the 2010 American Auto Racing Writers and Broadcasters (AARWBA) First-Team All America. On May 27, as part of his USAC National Driver Championship, package, he will compete in the Firestone Indy Lights “Freedom 100” on Miller Light Carb Day at the Indianapolis Motor Speedway. Later that night he will also compete in the prestigious “Hoosier Hundred” USAC Silver Crown Championship race at the Indiana State Fairgrounds. The pavement-dirt combo offers a distinct challenge to the 21-year-old, although seven of his 2010 National victories came on dirt and three on pavement. “The Freedom 100 weekend is a weekend I've had circled on my calendar from the time USAC and INDYCAR announced the partnership,” says Clauson. At least four USAC graduates have gone on to win in the Firestone Indy Lights Series. Silver Crown, Sprint and Midget graduate Ed Carpenter won the inaugural Freedom 100 in 2003 and open-wheel star Aaron Fike won the same year at Pikes Peak International Raceway. Formula Ford 2000 participant Arie Luyendyk Jr. won at Chicagoland in 2008. 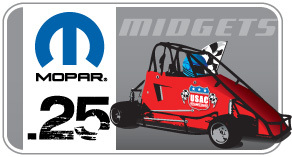 Last year, USAC Midget graduate Brandon Wagner won the series finale at Homestead-Miami Speedway. Additonal information regarding these races can be found at www.usacracing.com or www.trackenterprises.com or www.indycar.com or by calling USAC at 317-247-5151, Track Enterprises at 217-764-3200 or INDYCAR at 317-492-6526. **All Quarter Midget Drivers....... remember.... Bryan Clauson started his career driving a quarter midget. He was a member of the American Club in Sacramento, California.